Top seed, Wang Manyu, will be aiming for her first World Tour Grand Finals title in December. China currently occupies all of the leading positions in the Women’s Singles game heading into the World Tour Grand Finals and the nation’s expectations to land the coveted trophy for a 20thtime in 23 years are understandably high. WANG Manyu collected the most points on this year’s ITTF World Tour, her impressive haul (1,856) comfortably above second-placed Kasumi ISHIKAWA of Japan (1,576), and she will enter her second career WTGF event as top seed. The 19-year-old talent claimed more Women’s Singles titles than anyone else in 2018, namely the Hungarian, Hong Kong and China Opens. ZHU Yuling is world no. 1 going into the World Tour Grand Finals. The Chinese star and 7th seed, who claimed gold at this year’s Korean Open, will be looking to regain the WTGF title she won in 2016 in Doha. CHEN Meng is the current holder of the WTGF Women’s Singles crown. Whilst this has been a quieter year for the 24-year-old than 2017, she enters the tournament straight off the back of winning last week’s Austrian Open, a victory which saw her rise to 6th place in the ITTF World Tour standings. Having missed out on qualification for the 2017 World Tour Grand Finals, LIU Shiwen and DING Ning are back in it this year, providing the competition with two extremely experienced heads. 27-year-old LIU Shiwen remains the only player thus far to have won three consecutive WTGF titles (2011, 2012, 2013) and claimed the 2018 Qatar and Australian Opens to qualify as 3rd seed. DING Ning too knows what it takes to win the World Tour Grand Finals, having celebrated victory at the 2015 edition in Lisbon. The 28-year-old world no. 2 triumphed at this year’s Bulgarian Open and enters the competition as 5th seed. Crazy point in the epic 7 game battle between Ding Ning and Wang Yidi in the women’s singles final! Congratulations to Ding Ning for winning the title at Bulgaria Open for the first time in her career! Meanwhile, FENG Tianwei of Singapore completes the list of former WTGF champions to participate in this year’s event. 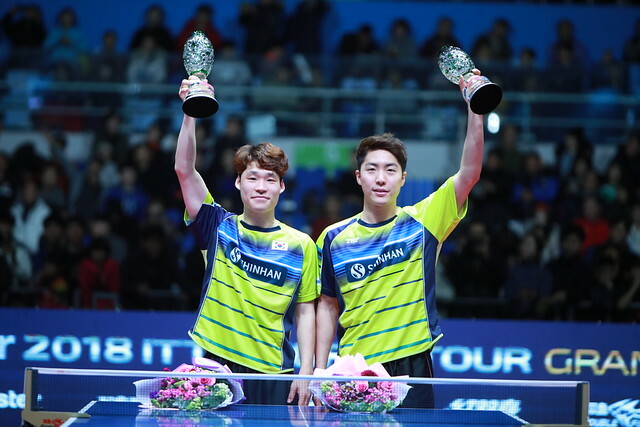 The 32-year-old was victorious the last time Korea hosted table tennis’ annual showpiece finale back in 2010 in Seoul. Kasumi ISHIKAWA and Mima ITO were Japan’s two outstanding players on the 2018 ITTF World Tour, finishing 2nd and 4th respectively. ISHIKAWA – champion at the World Tour Grand Finals in 2014 – claimed gold at this year’s German and Czech Opens, whilst ITO got her hands on the Japanese and Swedish Open titles. The fact that half of the Women’s Singles draw consists of Chinese players will not strike fear into 18-year-old ITO, who has won 12 of her last 17 matches against Chinese opposition. Japan has three more representatives at the World Tour Grand Finals: Hitomi SATO (11th), Miu HIRANO (13th) and Saki SHIBATA (16th). SATO and HIRANO are both featuring for a third straight year. SUH Hyowon will be receiving the backing of the home crowd when the World Tour Grand Finals kick off in Incheon. Korea’s only representative in the Women’s Singles enters the competition as 8thseed. Following up in 9th place is CHENG I-Ching of Chinese Taipei, while adding to the lengthy list of Chinese competitors are CHEN Xingtong (10th), HE Zhuojia (12th) and SUN Yingsha (14th).